Last week, Purplebricks announced that it had acquired DuProprio/ComFree, the leading fixed-fee and for-sale-by-owner business in Canada, for £29.3 million. Why it matters: This is a great deal for Purplebricks and further strengthens its position as the online agency leader with global ambitions. Disclaimer: I played a small but important part in this deal, and in the past, I have done strategy work with DuProprio. All information in this update is in the public domain (and sourced), and the opinions are my own. If you’re looking at the leaders who are changing the way consumers buy and sell houses, two of the biggest global names are Purplebricks and DuProprio. DuProprio/ComFree is one of the most successful real estate companies no one has ever heard of. I’ve written about the business in past. Why is it a big deal? With a model similar to Purplebricks, it lists over 40,000 properties each year (about the same number as Purplebricks last year), generates over $40 million (Canadian) in revenues and has over 20 percent market share in Quebec (by comparison, Purplebricks has around 5 percent market share in the U.K.). This deal represents two global leaders combining forces under one banner, and an excellent market entry into Canada for Purplebricks. This acquisition is a big deal for Purplebricks. 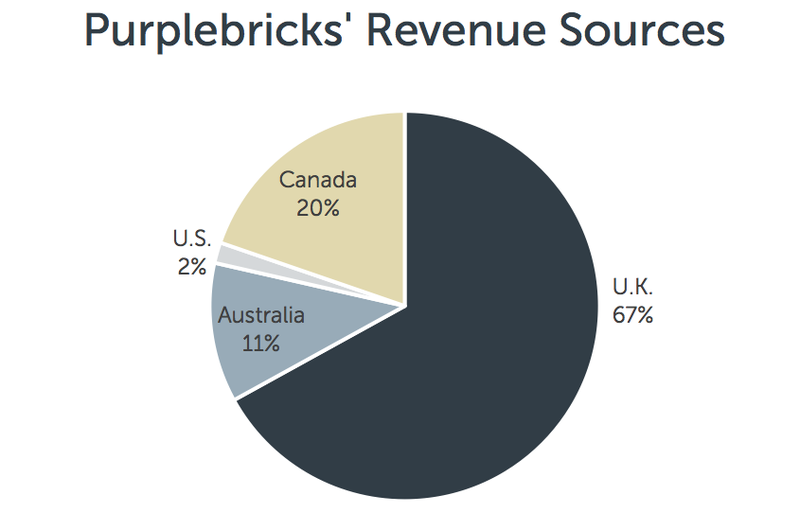 From a revenue standpoint, Canada immediately becomes Purplebricks’ second-largest market. That’s a 25 percent bump in revenue from just one deal. And what a deal it was. Purplebricks acquired DuProprio for a steal. Let me illustrate by looking at the relative enterprise value (EV) of each business compared to their revenues (source). This is huge. The financial markets are valuing the Purplebricks business at a ratio 10 times higher than the implied value of DuProprio. 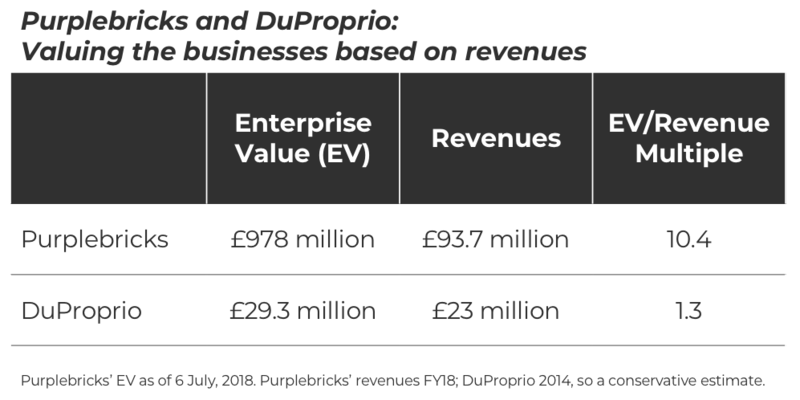 In other words, when Purplebricks spent £29.3 million to acquire DuProprio, it instantly created nearly £240 million in value to shareholders (£23 million in revenues valued at Purplebricks’ revenue multiple). As we continue to streamline and focus our operations, we believe the divestiture of [DuProprio/ComFree] is another very positive step for Yellow Pages and our stakeholders. Under the terms of our senior secured notes, the cash proceeds will be included in the next scheduled note redemption payment, on November 30, 2018. DuProprio’s revenues in 2014 were around $40 million Canadian (source), and Purplebricks’ guidance is for around $43 million Canadian in revenues for its next financial year. So while the business has not gone backward under Yellow Pages, growth has been muted. The question of build versus buy is always top-of-mind when a business looks to enter a new market. Does it spend big money to launch an operation from scratch or simply acquire an existing player? Including Canada, Purplebricks has now entered three new markets. In the case of Australia and the U.S., it started from scratch, spending big to build market share over a number of months and years. Based on its full-year financial results, Purplebricks spent £17.8 million to generate £2 million in revenue in the U.S. Those are expensive — but not surprising — startup costs for a big new market. Over the past 20 months in Australia, Purplebricks has spent £26 million to generate £17 million in revenues. It’s taken a long time and a big investment, but that business is finally approaching breakeven. By comparison, Purplebricks spent £29.3 million for £23 million in revenues in Canada, a materially better ROI that took no time at all. And keep in mind, that’s a one-time expense; the revenues keep on coming year after year. It’s not every day an opportunity like this comes up. But given the chance, buying its way into Canada was a smart move for Purplebricks. Global by design: International expansion is a unique and key tenet of Purplebricks’ strategy. No other company in this space (Opendoor, Redfin, Compass, Emoov, Yopa and dozens of others) has expanded beyond one market. Purplebricks is now in four. A great deal: This was a good use of capital and has manifested in a new valuable asset for Purplebricks. Good deals like this exist in the space; you just have to know where to look. Canadian growth potential: With new (and arguably better capitalized) ownership, DuProprio/ComFree is primed for growth, with Purplebricks ready to invest £15 million further into the business.